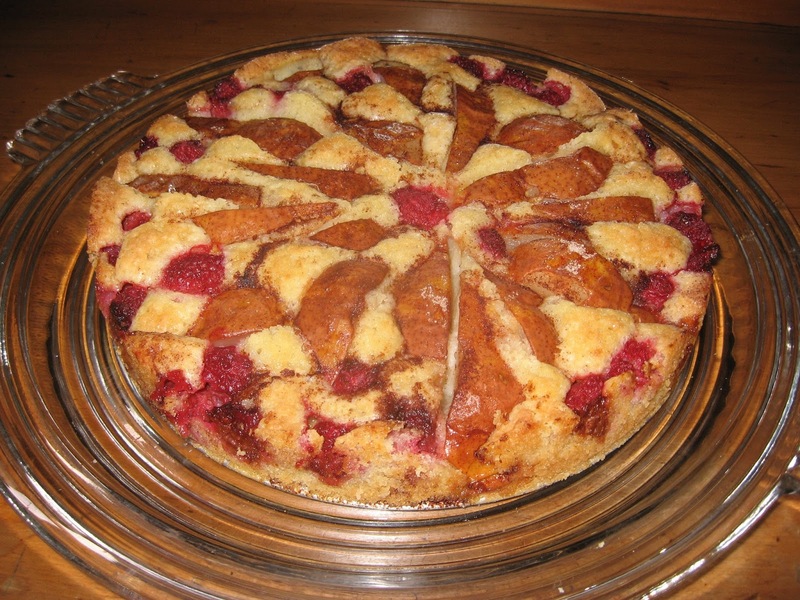 HALLIE EPHRON: Last week I made Marian Burros's plum torte. The recipe was first published in 1983 in the New York Times, and has been published every year as a sort of fall ritual. But I'd never heard of it until a friend made it for us a year ago. Last week I followed the recipe. The batter is basically like a cookie dough (cream butter and sugar, add flour and eggs and baking powder...) schmered over the bottom of a springform pan; then press (unpeeled!) sections of plum into the batter, sprinkle with sugar and cinnamon (and lemon juice), and bake. That's it! Easy peasy. You don't even have to grease the pan. 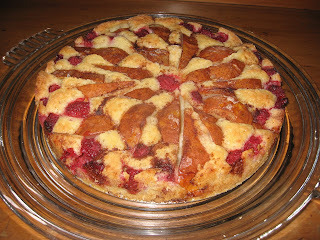 This week I made it again using pears and raspberries and added almond extract to the batter. Spectacular. Again. I used very ripe Anjou pears; I think Bartletts would be even better. BEST would be tiny seckle pears but there're not yet in the market. If you use seckle pears, use about 10 cut them in half (remove the seeds and stem). 3. Spoon batter into the bottom of a springform pan and smooth out. 4. Place chunky pear slices SKIN SIDE UP, pressing them lightly into the batter. Press in the raspberries, too. 5. Sprinkle with cinnamon and sugar to taste. Add a few squeezes of lemon if the pears need a little zip. Mine did. 4. Bake about an hour; cool. Serve cool lukewarm with whipped cream. Next spring, I'll try this with peaches. And apricots. Thanks for the recipe . . . I love pears and raspberries --- and this looks fabulous. I can’t wait to try it! It's great that your tweaked version of the original 1938 plum torte recipe is easy, and variations can be made. Pears and almonds go together naturally so adding the extract makes sense, and this is a nice autumn recipe. I have made a peaches and raspberry torte (or galette) several times where the two fruits go together well, but that's a summer pairing. Thanks for sharing the recipe, Hallie! Oh yes, that sounds delish! I cut the recipe out too--I'm sure it would be yummy with peaches. And how about cherries or blueberries? Peahes, yes! CHERRIES, YES! Blueberries? Maybe. I thought about that but I was afraid blueberries would fall apart and turn the whole thing blue. Has anyone tried it? Oh Hallie, you're brave. I'm always afraid to depart from a baking recipe. Hallie, I agree with you that the blueberries would probably bleed out in any cake/muffin/torte recipe, and the result would not be so pretty. I only do blueberry (or cherries, great idea Lucy) in a galette for that reason. Has anyone baked with almond paste? Seems to me this would be great with a layer of it, but I don't know what you'd do with it. Not mix it into the batter, I'm sure. I make almond cookies with it. You could try beating it with something like the cookie recipe on the can and then slosh it around in between the fruit hunks. Can you tell I fly by the seat of my pans? Yummy! And I bet the aroma is spectacular. Love the idea of adding the almond extract. As to blueberries--if you don't break them up while adding them, they will probably behave pretty well. And taste lovely. I have baked with both almond paste and marzipan, Hallie. Not as a separate layer, but I added the almond paste right into the batter with the other dry ingredients. I have made squares and cookies with almond paste or marzipan, so I think it would work ok in a torte. I once planned to make a raspberry pie, only to find that between the mold hidden in the middle of one container and my husband raiding the supply there were not enough. So in desperation, I added some cut up nectarines to make up the difference. Best pie, ever. Mold in raspberries --do you eat the okay looking ones? I can never decide ..
Hallie that sounds amazing ! Karen, I'll be nectarines would be great. And Hallie, I bought peaches at the farmer's market yesterday which are all going to ripen at the same time and I was wondering what I should do with them. I'll let you know! I want to try the original plum version, too. For the purists among us, most of the almond extract found in your supermarket are imitation almond flavoring. You can get real almond extract on Amazon and it's lovely. I'm baking this. Thanks for sharing.